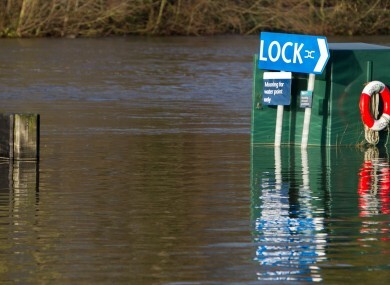 Areas next to the River Thames in Chertsey, Surrey, are flooded after the river burst its banks yesterday. A MAN DIED after his mobility scooter fell into the River Thames today, police said, as dozens of flood warnings remained in place across Britain. The 47-year-old was pulled from the river near Oxford, south England, after he fell in while trying to avoid a flooded pathway. More than 200 homes along the west coast of Britain have been flooded after heavy rains, strong winds and high tides hit the country over recent days. Around 70 flood warnings remain in place with more stormy weather forecast. “The risk of flooding to the coast will continue over the next few days, especially on the south and west coast and along the Severn estuary,” said Environment Agency spokesman Jonathan Day. Rescuers are still searching for 18-year-old Harry Martin, who disappeared after going to take photographs of stormy seas in Devon, southwest England, on Thursday. Email “Man dies as storms batter UK”. Feedback on “Man dies as storms batter UK”.